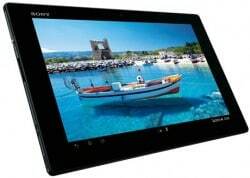 The Sony Xperia Tablet Z is a high-end 10.1-inch Android 4.1 tablet with a 1,920 by 1,200 screen. A Qualcomm 1.5GHz quad-core APQ8064 processor, 2GB RAM, 32GB storage and LTE is packed into a 6.9mm thick package weighing 495g. The device offers NFC for pairing and sharing, along with WiFi and Bluetooth 4.0. The Xperia Tablet Z was announced on 20 January 2013 and will ship in Japan in the spring.